TwinsFest starts today, and it was just announced that all federal employees (and their families) get FREE TwinsFest tickets! Call the box office to reserve your tickets (612.33.TWINS), then present your federal ID at Will Call for pickup. Some restrictions apply; limited to availability. 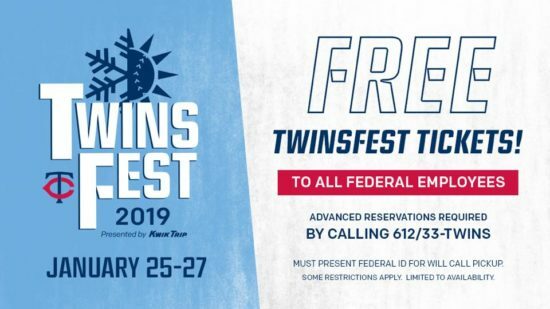 If you’re not a federal employee, you can still buy tickets to TwinsFest. Adult tickets are $20, and child tickets (12 and under) are $10. You can also download free MetroTransit ride passes to skip the hassle of finding a parking spot (and paying for it).